Who Are The Toronto Northern Lights? 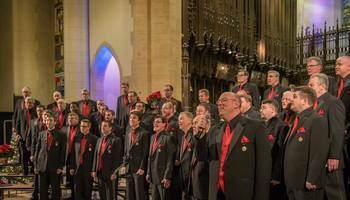 The Toronto Northern Lights are the premier men's a cappella and barbershop chorus in Toronto, Ontario. All our rehearsals are open to the public and to potential new members. Why not pay us a visit and see what we're about? We rehearse every Monday evening at 7:00pm, at Willowdale Baptist Church, 15 Olive Ave, North York, ON. Chorus Rehearsals Back In Full Swing! Would You Like Toronto Northern Lights to sing at your next function? Why not hire Toronto Northern Lights to entertain at your next event? We can perform at corporate functions, charity events, community entertainment events, birthday parties, christmas parties, awards nights, weddings, engagements, anniversaries, engagements, and even funerals and memorial services.